From an expansive aquarium to a high-profile event center, young designers from the University of Minnesota have bold ideas for what a redeveloped downtown post office could look like in the next decade. Graduate architectural students from the university’s College of Design recently unveiled their own ideas for transforming roughly 8 acres of high-profile riverfront real estate. Local leaders are taking the designs and starting conversations about how the public and private sectors can begin to plan a singular vision for the 1930s Art Deco building, its surrounding buildings and the nearby Gateway Park. Downtown boosters took a moment April 2 to reflect on where the site was nearly a century ago and where it could go in the next five or 10 years. The student visions for the site are just ideas meant to create conversations at this point. A representative with the U.S. Postal Service did not attend the meeting. No developer or public agency has released a proposal for the site, and no funds have been allocated toward a redevelopment yet. But local leaders say the decline of mail volume coming out of the post office and the building’s irksome location blocking the riverfront have renewed plans to repurpose the site for future uses. “The post office has served a wonderful purpose over decades, over many, many years right now, but the truth is that snail mail is slowing to a trickle,” said Mayor Jacob Frey, who called the site the “most valuable real estate” in the city. The site features four buildings, including the main post office building, an annex building built shortly after, a much newer addition and a parking garage from the 1970s. Wilson said this represents more than 1 million square feet of space and hundreds of parking spaces, both in the garage and underground. A redevelopment would likely feature a private historic reuse of the building and a public park component, he added. “It’s a huge, huge facility, so I think we can have lots and lots of uses, both private and public, on that site,” he said. Rich Varda, a design principal with RSP Architects and a board member with the Minneapolis Parks Foundation, said what they’ve learned from the student designs is that the building can become a destination, from an active town center serving residents and workers to a huge green space rivaling Chicago’s Millennium Park. Minneapolis Park and Recreation Board Commissioner Jono Cowgill, whose District 4 includes the riverfront, thanked the students for getting people excited so they can dig deeper into a redevelopment vision. “We have thousands, tens of thousands of new residents that are going to be moving to downtown Minneapolis if we have anything to do with it. And if we’re going to do that, we need to have a vision for green space in all of those spaces,” he said. 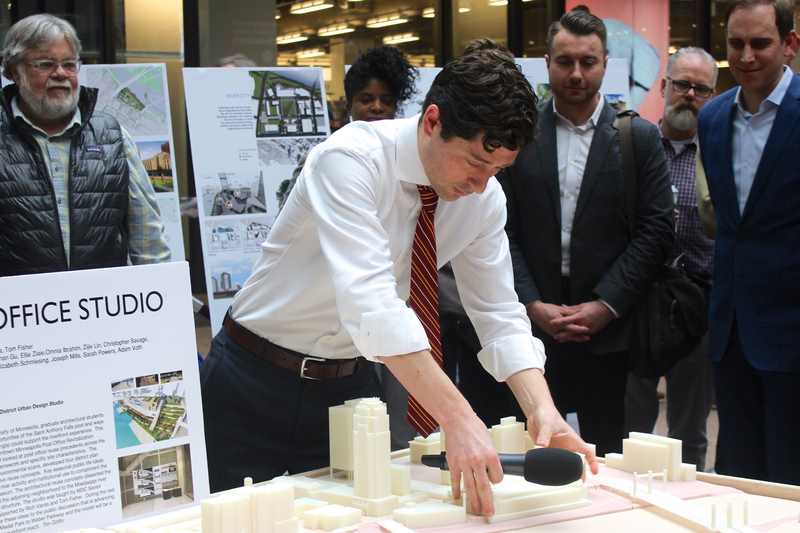 As far as the next steps go, Wilson said Green Minneapolis will serve as a shepherd, working with government officials, such as Sen. Amy Klobuchar, to make them aware of a redevelopment plan. Ultimately, he said, the Postal Service will need to agree with the City of Minneapolis and Park Board on a plan. “We’re really playing the organizing role to get all these different parties working together and headed in a similar direction,” he said. The student visuals will be on display at the IDS Center Crystal Court through April 13. “This is the beginning of a long process that is going to inspire many conversations on the part of many stakeholders, but the reason we want to get going now is that the opportunity is enormous,” said Jay Cowles, a board member of the Minneapolis Downtown Council and Downtown Improvement District.